Kolintang musical instruments first came to Austria in 1984, and played a year later in the Christmas celebration taking place in Albertschweitzer Haus. After that, Kolintang musical instruments regularly performed for various cultural nights organized by either churches or other prominent institutions in Vienna. It has been guest to 9 Austrian provinces and performed in many Austrian cities. Due to its fast growing popularity in Austria more Kolintang performances were held. 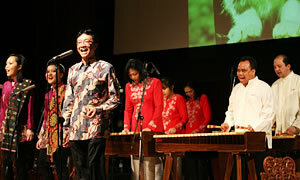 With the support of the Indonesian Embassy in Vienna, Austria, Kolintang could also perform in other countries such as Bulgaria, Italy and Germany. In 2005, Kolintang Musical Group was given the privilege to use the name of Kawanua Österreich due to the origin of Kolintang musical instruments which come from Minahasa, North Sulawesi, Indonesia. Since then, whenever Kolintang is performing in public, this name is used. Members of the Kolintang Musical Group include Indonesians who live in Austria and staff of the Indonesian Embassy in Vienna, Austria.